Larval recruitment, the transition of pelagic larvae into reef-associated juveniles, is a critical step for the resilience of marine fish populations but its molecular control is unknown. Here, we investigate whether thyroid-hormones (TH) and their receptors (TR) coordinate the larval recruitment of the coral-reef-fish Acanthurus triostegus. We demonstrate an increase of TH-levels and TR-expressions in pelagic-larvae, followed by a decrease in recruiting juveniles. We generalize these observations in four other coral reef-fish species. Treatments with TH or TR-antagonist, as well as relocation to the open-ocean, disturb A. triostegus larvae transformation and grazing activity. Likewise, chlorpyrifos, a pesticide often encountered in coral-reefs, impairs A. triostegus TH-levels, transformation, and grazing activity, hence diminishing this herbivore’s ability to control the spread of reef-algae. Larval recruitment therefore corresponds to a TH-controlled metamorphosis, sensitive to endocrine disruption. This provides a framework to understand how larval recruitment, critical to reef-ecosystems maintenance, is altered by anthropogenic stressors. Many animals go through a larval phase before developing into an adult. This transformation is called metamorphosis, and it is regulated by hormones of the thyroid gland in vertebrates. For example, most fish found on coral reefs actually spend the first part of their life as free-swimming larvae out in the ocean. The larvae usually look very different from the juveniles and adults. When these fish become juveniles, the larvae undergo a range of physical and behavioral changes to prepare for their life on the reef. Yet, until now it was not known what hormones control metamorphosis in these fish. To address this question, Holzer, Besson et al. studied the convict surgeonfish Acanthurus triostegus. This herbivorous coral-reef fish lives in the Indo-Pacific Ocean, and the results showed that thyroid hormones do indeed regulate the metamorphosis of its larvae. This includes changing how the larvae behave and how their adult features develop. Further, Holzer, Besson et al. found that this was also true for four other coral-reef fish, including the lagoon triggerfish and the raccoon butterflyfish. In A. triostegus, thyroid hormones controlled the changes that enabled the juveniles to efficiently graze on algae growing on the reef such as an elongated gut. When the fish larvae were then exposed to a pesticide called chlorpyrifos, a well-known reef pollutant, their hormone production was disturbed. This in turn affected their grazing behavior and also their metamorphosis. These fish had shortened, underdeveloped guts and could not graze on algae as effectively. Herbivorous fish such as A. triostegus play a major role in supporting coral reef ecosystems by reducing algal cover and therefore promoting coral recruitment. These new findings show that pollutants from human activities could disturb the metamorphosis of coral-reef fish and, as a consequence, their ability to maintain the reefs. A next step will be to test what other factors can disrupt the hormones in coral-reef fish and thus pose a threat for fish populations and the coral-reef ecosystem. Life history transitions are critical for many animal species and often correspond to concomitant developmental and ecological shifts (Bishop et al., 2006). Unfortunately, little is known about how internal and external cues act in concert during these events. The life cycle of most teleost reef fish include a major developmental and ecological transition. Adults reproduce in the vicinity of the reef, emitting eggs that disperse and hatch in the ocean, where the larvae grow (Leis and McCormick, 2002). Larvae migrate back and enter reefs where they become juveniles, a step called larval recruitment (Leis and McCormick, 2002). This step involves the perception of environmental cues for larvae to localize and settle in the reef, and is accompanied by major morphological changes (McCormick et al., 2002; Lecchini et al., 2005b, 2005a; Lecchini et al., 2013; Barth, 2015). This transition of pelagic larvae into reef-associated juveniles is often referred to as metamorphosis and is critical for the maintenance of reef fish populations, but its molecular control remains largely unknown (Dufour and Galzin, 1993; Doherty, 2002; Leis and McCormick, 2002; McCormick et al., 2002; Dixson et al., 2011; Barth, 2015). Since larval recruitment is an ecological event coupled to a morphological transformation, reminiscent of the situation in amphibians, it may correspond to a thyroid hormones (TH) controlled metamorphosis (Bishop et al., 2006; Brown and Cai, 2007). TH and their receptors (TR) trigger and coordinate metamorphosis of many species such as Xenopus (Brown and Cai, 2007) or flatfish (Solbakken et al., 1999). The thyroid gland produces mainly the thyroxine hormone (T4), which is peripherally transformed into triiodothyronine (T3), the active form (Chopra, 1996). The transformation of T4 into T3, and the degradation of T4 and T3 are controlled by a family of enzymes called deiodinases (Bianco and Kim, 2006). TH levels peak at the climax of metamorphosis. Precocious treatment with TH triggers metamorphosis whereas goitrogen (TH synthesis inhibitors) treatment blocks it (Tata, 2006). Similar mechanisms have been described in several teleost fishes, but in contexts disconnected from the natural environment (Brown, 1997; de Jesus et al., 1998; Yamano and Miwa, 1998; Kawakami et al., 2003; Marchand et al., 2004; McMenamin and Parichy, 2013). In the convict surgeonfish Acanthurus triostegus, larvae have a planktonic diet while juveniles and adults are herbivorous, and external morphological changes occurring at recruitment have been previously described (Randall, 1961; McCormick, 1999; McCormick et al., 2002; Frédérich et al., 2012). Interestingly, crest-captured larvae can delay their metamorphosis when relocated to the external slope of the reef (open ocean), showing an influence of the environment on their morphological transformation (McCormick, 1999). Nevertheless, again, the molecular mechanisms remain unknown. Here we report that A. triostegus larval recruitment to the reefs corresponds to metamorphosis with major pigmentation changes, remodeling of the digestive tract and behavioral modifications. Our results show that TH levels and TR expressions control this remodeling process. Furthermore, recruiting larvae can freeze their TH signaling when relocated on the external slope, demonstrating an influence of the environment on metamorphosis. 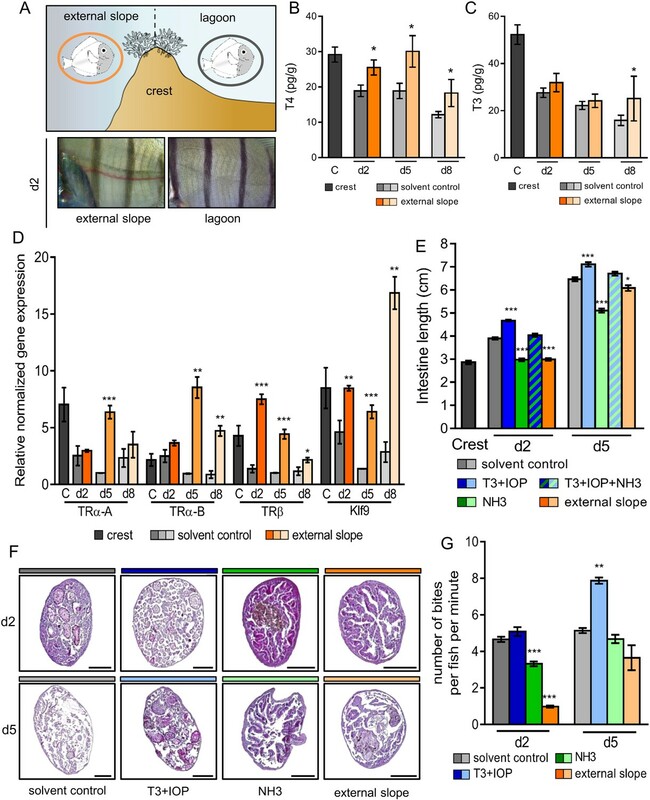 Chlorpyrifos (CPF), a known reef pollutant and endocrine disruptor (Roche et al., 2011; Botté et al., 2012; Juberg et al., 2013; Slotkin et al., 2013), affects A. triostegus metamorphosis by impairing TH signaling, preventing intestine lengthening, and inhibiting fish grazing activity. CPF therefore impairs A. triostegus control on algae spreading, which is a major threat for reef conservation. We extend our observation upon TH levels to four other coral reef fish species. Our work provides a unifying framework that integrates the developmental, ecological and evolutionary perspectives of vertebrate life history transitions. The involvement of the TH signaling pathway in this key post-embryonic step, thus prone to endocrine disruption, provides an obvious entry point to study how anthropogenic stressors may affect reef fish populations. A. triostegus crest captured individuals (n = 297) experience an important weight loss between day 1 (0.71 ± 0.01 g) and day 8 (0.53 ± 0.01 g) following their entry in the reef (Figure 1A–B). Individuals also undergo extensive pigmentation changes (Figure 1C–L), as exemplified by the very rapid appearance of black stripes (less than four hours, MB pers. obs.) after entering the reef (Figure 1C–D, H-I). This is followed by the widening of these vertical black stripes and by the onset of the body’s white pigmentation (Figure 1D–G, Figure 1I–L). Changes in Acanthrurus triostegus during larval recruitment. Error bars represent standard errors. *p-value<0.05; **p-value<0.01; ***p-value<0.001. (A) Schematization of the reef colonization by a larva (left) turning into a juvenile (right). The background color shading centered into the reef crest is re-used in following figures. (B) Weight variation during larval recruitment. n = 3 biological replicates for 5-to-10 km offshore fish (far), n = 5 for 2 km offshore fish (near) and n = 297 for crest to day 8 (d8) fish. Statistics: mean comparisons (Wilcoxon-Mann-Whitney U-test). See Figure 1—source data 1 for detailed data and statistics. (C–G) Variation in pigmentation and morphology at different sampling points, (C) crest larva, (D) day 2 juvenile, (E) day 3 juvenile, (F) day 5 juvenile and (G) day 8 juvenile; scale bars indicate 0.5 cm. The white square represent the magnified region shown in the line below. These pictures are representative of n > 50 fish (biological replicates) per developmental stage, sampled at n > 20 different times during the year (technical replicates). (H–L) Close-up on the pigmented middle body band. Scale bars indicate 0.2 cm. These pictures are representative of n > 50 fish (biological replicates) per developmental stage, sampled at n > 20 different times during the year (technical replicates). (M–Q) X-Ray microtomography of larva, dentition A, B or C are highlighted respectively in red, blue or green. Scale bars indicate 0.5 mm. These pictures are representative of n = 2 fish (biological replicates) per developmental stage. (R–V) Histological sections (5 µm width) of intestines with haematoxylin/eosin staining. Scale bars indicate 200 µm. These pictures are representative of n = 6 sectioning technical replicates, performed twice (sampling technical replicates), on n = 2 fish (biological replicate). (W) Intestine length variation of A. triostegus during its larval recruitment. n = 9 to 14 biological replicates for each developmental stage (from n = 2 technical sampling replicates). Statistics: mean comparisons (Wilcoxon-Mann-Whitney U-test). See Figure 1—source data 2 for detailed data and statistics. (X) Heatmap clustering of the 18S sequences identified in the intestine content of crest individual (n = 3, left panel), day 8 juveniles (n = 3, middle panel) and adults (n = 3, right panel). Each panel is made of three columns corresponding to one individual. Each line corresponds to one taxonomic group found in the intestines: Spermatophyta (dark green), Conoidasisa (cyan), Dinophyceae (light yellow), Protostomia (light mink), Phaeophyceae (brown), Florideophycae (dark pink), Chlorophyta (light green), Stramenopiles (orange) and Ascomycetes (grey). Furthermore, using conventional X-Ray microtomography, we identified three different dental generations in crest larvae to day 8 juveniles (red, blue and green, Figure 1M–Q). Crest larvae present tiny and poorly mineralized pointed teeth at the distal ends of the jaws (red, Figure 1M, Figure 1—figure supplement 1R) that are likely remnants of an oceanic larval dentition (dentition A). Other medium-sized and more mineralized teeth are in function in medial areas of the jaws (blue, Figure 1M). These teeth display pointed cusps and belong to a more advanced dental generation (dentition B). Lastly, much larger teeth of the next generation (green, dentition C) are about to erupt from jaws in crest larvae (Figure 1M) and replace A and B previous dentitions in day 2 to day 8 juveniles (Figure 1N–Q). These teeth are highly similar to the shovel-shaped adult teeth (Figure 1—figure supplement 1S) that serve for grazing algae on hard substrata. The rapid formation of dentition C is consistent with a diet shift from planktivorous to herbivorous at recruitment. This shift is precisely organized, since it begins in the sagittal area of all individuals, and secondarily extends to the distal parts of the jaw (Figure 1M–Q). The fact that crest captured larvae already have teeth of the C dentition about to erupt (Figure 1M) indicates that fish are prepared for reef life conditions before reef entry. The intestine also goes through a drastic remodeling at recruitment. In particular, the gastro-intestinal tract lengthens from about 2.52 ± 0.07 cm in crest captured larvae to 7.38 ± 0.14 cm in day 8 juveniles (Figure 1W). To characterize this change, we performed histological sections on the middle part of the intestine during the larval recruitment process (Figure 1R–V). Intestines of crest larvae and day 2 juveniles have a thick wall with many muscle fibers and regular villi (Figure 1R and S). At day 3, intestines undergo a spectacular remodeling with the disappearance of the epithelium, leaving only the muscular layer (Figure 1T), while epithelium reformation occurs later at day 5 (Figure 1U). In day 8 individuals, the intestine is fully remodeled: the epithelium is thicker and exhibits villi again (Figure 1V). Such spectacular remodeling events are also observed in the proximal and distal portion of the intestines (Figure 1—figure supplement 1A–O). To assess whether and to what extent this intestine remodeling was correlated to a diet shift at larval recruitment, we sequenced A. triostegus digestive tract content (18S mass sequencing) to identify its eukaryotic composition. We investigated crest captured individuals, day 8 juveniles and adults (Figure 1W) using a blocking primer to minimize amplification of host sequences. Crest larval intestines are largely empty although we identified sequences of fungi and algae. In day 8 juveniles, the intestinal content is different with more brown and red algae, as well as few protostome sequences. This indicates a shift in the eukaryotic gut content between crest individuals and day 8 juveniles. Adults gut content is less diversified and is mainly composed of brown algae, red algae and alveolates, different from those found in day 8 juveniles (Figure 1W). Using 16S metagenomic sequencing, we found differences in the relative quantity of bacterial community between the juveniles at day 2, 5 and 8 (Figure 1—figure supplement 1P). The 16S profile of the adult is also different from the juvenile profile, with the notable presence of Lachnospiraceae, among which the giant bacteria Epulopiscium fishelsoni is a well-known symbiont of Acanthuridae (Clements and Bullivant, 1991). Given the role of TH in vertebrate metamorphosis (Laudet, 2011) and the spectacular transformations that A. triostegus undergoes at larval recruitment, we analyzed TH levels in larvae captured in the far ocean (from 5 to 10 km offshore, n = 3), near ocean (2 km offshore, n = 5), crest-captured larvae and juveniles (raised in situ in lagoon cages, n = 297) up to day 8 after recruitment (Figure 2A–B). Thyroid hormone signaling during Acanthurus triostegus metamorphosis. Error bars represent standard errors. *p-value<0.05; **p-value<0.01; ***p-value<0.001. (A) T4 and (B) T3 dosage: Y-axis: T4 and T3 levels in pg.g−1; X-axis: sampling point. n = 3 for 5 to 10 km offshore fish (far), n = 5 for 2 km offshore fish (near), n = 297 for crest to day 8 (d8) fish. Statistics: mean comparisons (Wilcoxon-Mann-Whitney U-test). See Figure 2—source data 1 and Figure 2—source data 2 for detailed data and statistics. (C) Expression level of TRα-A, TRα-B, TRβ and Klf9 by qPCR, normalized with Pold2 and Rpl7. Y-axis; Relative normalized expression X-axis: gene and sampling point.. Far ocean larvae are split in two groups: Far a (black stripes) and Far b (white). For each panel, the color shading is the same one as in Figure 1A. For each sampling point three biological replicates and three technical replicates were performed. Statistics: comparisons of each mean to the Crest condition mean (Student's t cumulative distribution function, which was automatically computed by qPCR software CFX Biorad Manager, CFX Manager SH, 2017). See Figure 2—source data 3 for detailed data and statistics. T4 levels are low in far ocean larvae and rise in fish located closer to the reef (near ocean larvae), before dropping 6-fold between the near ocean larvae and the day 8 juveniles (p-value=0.001, Figure 2A). This indicates a peak of T4 in near ocean and in crest larvae. Far ocean larvae exhibit a high level of T3 but with an important variability (Figure 2B). Although these larvae live in the same ecological niche (i.e. open ocean) and are roughly of the same size (4.7, 5.5, and 6.3 mm), they were captured in different locations and are probably not at the same developmental stage. Near ocean and crest captured larvae have similar levels of T3 that are 6-fold higher than the level observed in day 8 juveniles (p-value < 0.001 Figure 2B). We characterized the three TR of A. triostegus: TRα-A, TRα-B and TRβ. These receptors have between 86% (TRα-A) and 96% (TRβ) sequence identity with their zebrafish orthologs (Figure 2—figure supplement 1A). The phylogenetic analysis indicates that each of the three TR clusters with its respective teleosts orthologs (Figure 2—figure supplement 1B). Moreover, transactivation assays show that these receptors behave as genuine TR (Figure 2—figure supplement 1C). We thus assessed the expression levels of TRα-A, TRα-B, and TRβ during A. triostegus development (Figure 2C), as well as Klf9, a conserved TR regulated gene (Denver and Williamson, 2009). Far ocean larvae have two profiles: one with a very low TR and Klf9 expressions (‘Far a’ ocean) and one with very high levels of expression (‘Far b’ ocean) (Figure 2C). This suggests that there are, at least, two distinct situations in far ocean larvae: larvae with low TH/TR levels and larvae in which TH/TR levels surge. 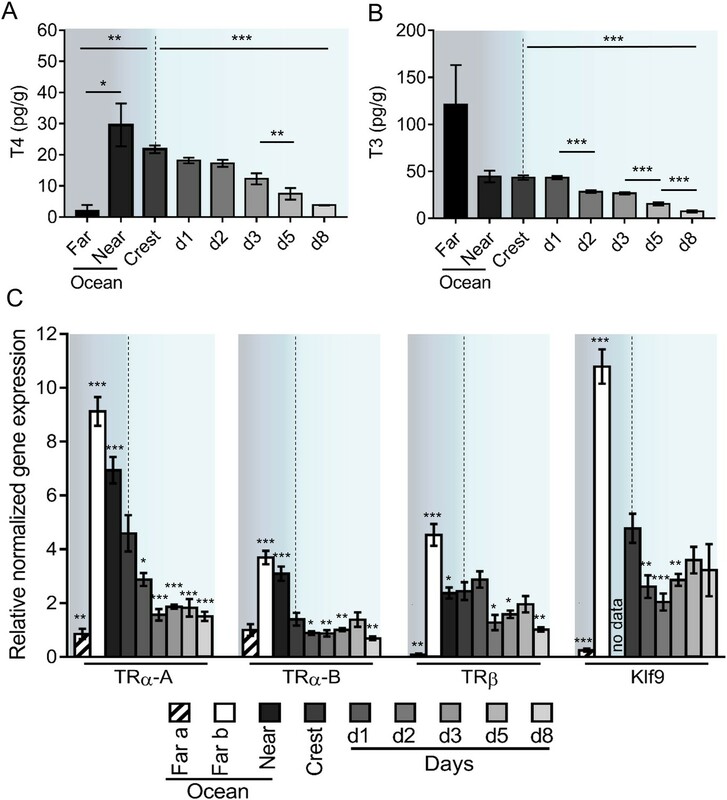 Far b ocean, near ocean, and crest larvae have high expression levels of the all the TR as well as Klf9, indicating a strong activation of the TH signaling at these stages. We observed a drop of all TR expression between crest larvae and day 8 juveniles (p-values=0.001, 0.005 and 0.002 for TRα-A, TRα-B and TRβ respectively, Figure 2C). To link the TH pathway, the environment and the metamorphic changes occurring at larval recruitment, we disturbed the TH signaling and the location of crest-captured larvae during their metamorphosis (from capture to up to day 8 after reef colonization). In order to study how the environment controls the metamorphosis processes, we first relocated crest-captured larvae back to the external slope immediately after their reef entry. Indeed, mimicking oceanic condition has been acknowledged to delay metamorphosis (McCormick, 1999) (Figure 3A, upper panel). Similar to this earlier study, we observed a striking delay in the white pigmentation appearance between the vertical black stripes in day 2 relocated fish compared to their lagoon raised counterparts (Figure 3A, lower panel). The levels of T4 and T3 in fish relocated on the external slope at day 2, day 5 and day 8 are overall higher than the levels of their control counterparts in the lagoon (Figure 3B–C). The levels of T4, in particular, remain similar in day 2 to day 8 juveniles to the levels in the crest condition (Figure 3B). The expressions of TRs and Klf9 in the relocated juveniles were also higher than in control juveniles at the same age (Figure 3E). This suggests that the environment effectively controls the metamorphosis by modulating the TH signaling. Impact of the environment and thyroid hormone signaling on Acanthurus triostegus metamorphic processes. Error bars represent standard errors. *p-value<0.05; **p-value<0.01; ***p-value<0.001. (A) Upper panel: schematization of the external slope experiment with control fish, in the lagoon (grey circle), and relocated fish, on the external slope (orange circle). Lower panel: comparison of the pigmentation between the relocated fish (left) and the control lagoon fish (right) at day 2. (B) T4 and (C) T3 dosage of crest captured larvae and day 2, 5 and 8 juveniles, in control (grey shade) or external slope (orange shade) conditions. n = 4 fish for each experimental condition. X-axis: sampling point, Y-axis: T4 or T3 level in pg.g−1. Statistics: mean comparisons between control and external slope (Wilcoxon-Mann-Whitney U-test). See Figure 3—source data 1 and Figure 3—source data 2 for detailed data and statistics. (D) Expression level of TRα-A, TRα-B, TRβ and Klf9 by qPCR, normalized with pold2 and rpl7 housekeeping genes, in control (grey shade) or external slope (orange shade) conditions. Y-axis: Relative normalized expression. X-axis: gene and stages. For each point three biological replicates and three technical replicates were performed. Statistics: comparisons of ‘external slope’ means to their ‘control’ counterparts (Student's t cumulative distribution function). See Figure 3—source data 3 for detailed data and statistics. (E) Intestine length in cm of fish at crest (C), day 2 (d2) or day 5 (d5) under different treatment conditions: solvent-control (grey shade), T3 +IOP treated at 10−6 M (blue shade), NH3 treated at 10−6 M (green shade), T3 +IOP + NH3 treated at 10−6 M (blue and green dashed shade) or located to the external slope (orange shade). n > 10 fish for each experimental condition. Statistics: ANOVA followed by Tukey posthoc tests, only significant differences with the respective solvent-control condition are indicated. See Figure 3—source data 4 for detailed data and statistics (F) Histological cross section (5 µm width) of intestine stained by haematoxylin/eosin. Scale bars indicate 200 µm. These pictures are representative of n = 2 microtome section and staining technical replicates, performed on n = 3 fish (biological replicate) per treatment and per developmental stage. Two technical replicates of this experiment were performed. (G) Mean number of bites (on turf algae) per fish in a batch of 18 fish at day 2 (d2) and day 5 (d5) under different treatment conditions: solvent control (DMSO, grey shade), T3 + IOP at 10−6µM (blue shade), NH3 at 10−6µM (green shade) or relocated to the external slope (orange shade). n = 3 to 6 independent bite counts (technical replicates) for each condition. Bite counting was not performed on crest captured individuals as A. triostegus larvae do not feed for at least 12 hr after colonizing the reef at night (MB pers. obs.). Statistics: same as in (E). See Figure 3—source data 5 for detailed data and statistics. To assess the implication of the TH signaling pathway on metamorphic processes, we then raised crest-captured larvae in situ in the lagoon and injected them daily, in their ventral cavity, with 20 µl of different drug solutions that activate or disrupt their TH molecular pathway. Four drug treatments were applied: (i) solvent control (DMSO diluted 10.000 times in Phosphate Buffer Saline 1X, as all drugs were made soluble in DMSO and diluted 10.000 times in PBS 1X); (ii) T3 +iopanoic acid (IOP) both at 10−6 M, IOP being used as an inhibitor of the deiodinase enzymes that therefore prevents the degradation of injected T3 (Galton, 1989; Little et al., 2013; Lorgen et al., 2015); (iii) NH3 at 10−6 M, NH3 being used as an antagonist of TR that prevents the binding of TH on TR (Lim et al., 2002; Renko et al., 2012) therefore disrupting A. triostegus TH pathway (Figure 2—figure supplement 1D); and (iv) T3 + IOP + NH3 all at 10−6 M to ensure the non-toxicity of NH3. We used intestine total length, internal structure of guts (intestinal microvilli), dentition and pigmentation as markers of the advancement of metamorphosis since they strongly change after reef recruitment (Figure 1). T3 + IOP treatment increases the length of the intestine in day 2 and day 5 juveniles (p-values<0.001, Figure 3E, blue). On the contrary, NH3 treatment partially prevents the intestines lengthening occurring after recruitment (p-values<0.001, Figure 3E, green). Injections of T3 + IOP + NH3 result in an intestine length similar to the control individuals at day 2 and day 5 (p-values=0.486 and 0.444 respectively, Figure 3E). This shows that T3 and NH3 effectively compete, and confirms the non-toxicity of NH3. In parallel, intestines of fish relocated on the external slope are shorter than those of their lagoon counterparts at day 2 and day 5 (p-value<0.001 and p-value=0.042 respectively, Figure 3E, orange). This shows that their development has been slowed down, similarly to what we observed with the NH3 treatment. A similar pattern was observed concerning the microvilli remodeling within guts. In the anterior part of the guts, while T3 + IOP treatment accelerates the loss of the intestinal microvilli at day 2 and accelerates the development and the thickening of a new epithelium at day 5 (Figure 3F, second column), NH3 treatment and external slope relocation prevent microvilli renewal at both day 2 and day 5 (Figure 3F, third and fourth column). These observations can be extended to the anterior, medium and posterior sections of the guts (see Figure 3—figure supplement 1). These changes are consistent with the notion that TH control remodeling of the guts at metamorphosis in A. triostegus. We did not observe any effect on teeth development neither with T3 + IOP or NH3 treatment, nor with external slope relocation (Figure 3—figure supplement 1). Given that teeth remodeling is a lengthy process that starts very early on in oceanic larvae and therefore before reef colonization, it is not surprising that the treatments performed on crest captured larvae do not affect (or are too late to affect) teeth development. Also, contrarily to individuals relocated on the outer slope, we did not observe any effect of T3 + IOP nor NH3 treatments on skin pigmentation at day 2 and day 5 (Figure 3—figure supplement 2). This suggests that pigmentation during the larva to juvenile transition is strongly coupled to the environment but is not directly under TH control that may not sustain such rapid pigmentation changes. Taken together: (i) intestine lengthening and remodeling are mediated by TH signaling; and (ii) disturbing the TH pathway disrupts the normal development of fish after larval recruitment, showing that TH effectively controls some major aspects of A. triostegus metamorphosis. Finally, we tested how TH signaling influences fish behavior. To achieve this, we used grazing activity (number of bites on algal turf), as A. triostegus larvae start to graze a couple of days after colonizing the reef, to investigate how TH signaling and metamorphosis completion influence the behavior of recruited fish. T3 + IOP treatment increases the grazing activity by around 50% in day 5 juveniles when compared to the control individuals (p-value=0.004, Figure 3G, blue lanes). On the contrary, NH3 treatment significantly decreases the number of bites at day 2 by 33% (p-value<0.001, Figure 3G, green lane). The grazing activity of fish relocated on the external slope (Figure 3A) is also diminished by more than 4-fold at day 2 (p-value<0.001, Figure 3G, orange lanes). These data indicate that TH signaling promotes the biting activity of A. triostegus and subsequent grazing behavior adopted at larval recruitment. This shows that TH controls the transformations of the feeding process not only at the morphological and physiological levels but also at the behavioral level. 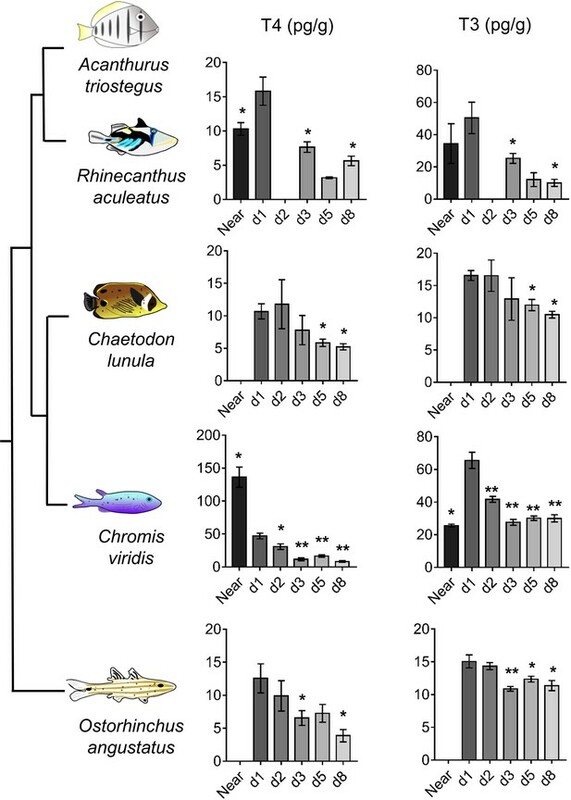 To widen our understanding of coral reef fish metamorphosis, we investigated the TH signaling during larval recruitment in four other coral fish species (Rhinecanthus aculeatus, Chromis viridis, Chaetodon lunula and Ostorhinchus angustatus) from distant families (Near et al., 2012). In these species, both T4 and T3 levels drop between day 1 and day 8, up to 3-fold for T4 (in O. angustatus, p-value=0.029) and up to 4-fold for T3 (in R. aculeatus, p-value=0.05) (Figure 4). This drop of TH levels after reef entry strongly suggests that TH are also key determinants for the metamorphosis of these species. T4 levels in R. aculeatus and T3 levels in C. viridis also rise between near ocean and day 1 individuals (Figure 4), further confirming the model of a TH-mediated metamorphosis during coral reef fish larval recruitment. However, T4 levels are 3-fold higher in near ocean individuals than in day 1 individuals in C. viridis (Figure 4). This suggests some potential species-specific variation in coral reef fish TH profiles at recruitment that would be extremely interesting to decipher in future studies on additional species and with regards to other aspects of coral reef fish ecology (e.g., diets, size and pigmentation status at recruitment). Thyroid hormone levels in distant coral reef fish at larval recruitment. Error bars represent standard errors. *p-value<0.05; **p-value<0.01; ***p-value<0.001. TH levels of: Rhinecanthus aculeatus (upper), Chromis viridis (middle up), Chaetodon lunula (middle low) and Ostorhinchus angustatus (lower). n = 3 to 5 biological replicates for each condition. First column is T4, second column is T3. Y-axis: T4 or T3 level in pg.g−1. X-axis: sampling point (developmental stage). The phylogenic relationship between the species is plotted on the far left of the figure. Statistics: for each species, comparisons of each mean to the day 1 (d1) mean (Wilcoxon-Mann-Whitney U-test). See Figure 4—source data 1 for detailed data and statistics. Chlorpyrifos (CPF) is an agricultural insecticide that is widely used on tropical coastal crops, therefore one of the most common waterborne chemical pollutants encountered in coral reef surrounding waters (Cavanagh et al., 1999; Leong et al., 2007; Roche et al., 2011; Botté et al., 2012). Given the endocrine determinants of coral reef fish metamorphosis (Figures 2–3) and the CPF endocrine disruption characteristics (Juberg et al., 2013; Slotkin et al., 2013), we assessed the impact of CPF on A. triostegus metamorphosis. To achieve this, we used exposure doses previously reported in coral reef fish (1, 5 or 30 µg.l−1 of seawater) (Botté et al., 2012). CPF treatment at 30 µg.l−1 decreases the T3 levels by 50% in day 2 juveniles (p-value=0.021, Figure 5A). No significant effect was observed on T4 levels regardless of CPF concentration and duration (p-value=0.205 for day 2 and p-value=0.496 for day 5, Figure 5—figure supplement 1A). We did not observe any effect of CPF treatments on fish pigmentation at day 2 and day 5 (Figure 5—figure supplement 1B). However, CPF exposure at 30 µg.l−1 prevents guts’ lengthening at day 2 (p-value=0.024, Figure 5B left panel), and both exposure at 5 and 30 µg.l−1 prevent intestines’ lengthening at day 5 (p-values=0.047 and 0.029 respectively, Figure 5B right panel). Strikingly, CPF exposure at 30 µg.l−1 also decreases the grazing activity of day 2 juveniles with 2.63 ± 0.09 bites per fish per min contrasting with 3.62 ± 0.28 bites per fish per min in the solvent control condition (p-value=0.014, Figure 5C). In day 5 juveniles, exposure at 5 and 30 µg.l−1 decreases the grazing activity with respectively 2.68 ± 0.18 and 2.63 ± 0.05 bites per fish per min compared to 4.43 ± 0.33 bites per fish per min for the solvent control fish (p-values=0.001, Figure 5C). Such a behavior in fish treated with CPF results in up to a 14-fold reduction in the biomass of turf grazed after 5 days (p-value=0.05, Figure 5D). Influence of chlorpyrifos exposure on Acanthurus triostegus thyroid hormone signaling, intestine length, grazing activity, and algal removal efficiency. Error bars represent standard errors. *p-value<0.05; **p-value<0.01; ***p-value<0.001. (A) T3 level in pg.g−1 of day 2 (d2) and day 5 (d5) fish exposed to different conditions: solvent control (C, acetone, white bars), or exposed to CPF at 1 µg.l−1 (1, light yellow bars), 5 µg.l−1 (5, yellow bars) or 30 µg.l−1 (30, dark yellow bars). Exposure started right after crest capture. n = 10 fish in each condition. Statistics: ANOVA followed by Tukey posthoc tests, only significant differences with the solvent-control condition are indicated. See Figure 5—source data 1 for detailed data and statistics. (B) Intestine length in cm of fish at day 2 (d2) or day 5 (d5) under different conditions: solvent control (C, acetone, white bars), or exposed to CPF at 1 µg.l−1 (1, light yellow bars), 5 µg.l−1 (5, yellow bars) or 30 µg.l−1 (30, dark yellow bars). Exposure started right after crest capture. n = 5 to 8 fish for each experimental condition. Statistics: same as in (A). See Figure 5—source data 2 for detailed data and statistics (C) Mean number of bites (on turf algae) per fish in a batch of 18 fish on reef turf at day 2 (d2) or day 5 (d5), under different conditions: solvent control (C, acetone, white bars), or exposed to CPF at 1 µg.l−1 (1, light yellow bars), 5 µg.l−1 (5, yellow bars) or 30 µg.l−1 (30, dark yellow bars). Exposure started right after crest capture. n = 3 independent bite counts for each condition. Statistics: same as in (A). See Figure 5—source data 3 for detailed data and statistics. (D) Mean turf biomass removed per fish in a batch of 10 fish, in 5 days following reef colonization, under different conditions: solvent control (C, acetone, white bars), or exposed to CPF at 1 µg.l−1 (1, light yellow bars), 5 µg.l−1 (5, yellow bars) or 30 µg.l−1 (30, dark yellow bars). Exposure started right after crest capture. n = 3 independent measurements of grazed turf for each condition. Statistics: comparisons of each mean to the solvent-control (C) mean (Wilcoxon-Mann-Whitney U-test). See Figure 5—source data 4 for detailed data and statistics. In this study, we investigated the morphological, physiological and behavioral changes occurring during A. triostegus larval recruitment. These results highlight profound anatomical and physiological transformations of the skin and the whole digestive tract (Figure 1B–W). In particular, the differences in 16S gut content are likely the consequence of a diet shift (carnivorous to herbivorous) and an environmental shift occurring during larval recruitment (Frédérich et al., 2012; Baldo et al., 2015; Sullam et al., 2012). We hypothesize that intestine remodeling (i.e. the loss of the villi and internal structures) accelerates the shift of the gut microbiota by allowing the establishment of a new bacterial community fitting the diet change. The presence of Lachnospiraceae in the adult but not in the larvae is consistent with the hypothesis that this family of bacteria is acquired through the environment in surgeonfishes (Miyake et al., 2016). Altogether, these observations reinforce the notion that the fish bacterial community depends on their diet and environment. These shifts of 16S and 18S gut contents, occurring between crest individuals and day 8 juveniles, strikingly coordinate with both the changes of the intestine and teeth morphologies observed during larval recruitment (Figure 1M–V). All these changes from teeth to microbiota are consistent with A. triostegus change of diet after entering the reefs, conforming to previous observations (Randall, 1961; McCormick, 1999; Frédérich et al., 2012). This complete remodeling is associated with a severe weight loss (Figure 1B), suggesting that larval recruitment corresponds to a real metabolic challenge. The molecular investigation of TH signaling in the recruiting larvae indicates a surge of TH levels and TR expressions in near ocean larvae and crest individuals, and a drop in juveniles, after reef entry (Figure 2A–C). This indicates that migration towards the reefs marks the onset of metamorphosis and starts very early on (Figure 6A). Consequently, the transformation process is already well advanced when larvae reach the reef, suggesting that this event is triggered in the open ocean by, yet unknown, environmental cues (Figure 6A). After reef entry, T3 treatment increases gut length while external slope relocation and NH3 treatment delay the metamorphosis, although they could not completely interrupt it (Figure 3A–B). These results are consistent with the model of metamorphosis in amphibians (Brown and Cai, 2007) and other fish species (McMenamin and Parichy, 2013). It is interesting to relate the morphological and physiological changes we have observed in A. triostegus with the TH-controlled post-embryonic process known in zebrafish (the major teleost fish developmental model, one of the few teleost fishes in which we have a functional knowledge of the metamorphosis process). Indeed, in both species, as well as in flatfish, another classical teleost model of metamorphosis, major pigmentation and craniofacial changes occur at metamorphosis (McMenamin and Parichy, 2013; McMenamin et al., 2014). It is not clear if the appearance of the dark melanophore stripes in zebrafish and A. triostegus is controlled by similar mechanisms. In A. triostegus, this event is extremely rapid (as fast as 2 hr after reef entry, MB pers. obs. ), and strongly environmentally coupled, whereas in zebrafish juveniles the pigment pattern changes very gradually and is presumably not under selection for rapid change during metamorphosis (McMenamin et al., 2014). However, melanophores can differentiate rapidly (in less than 12 hr) when appropriately stimulated in juvenile zebrafish. For example, acute stimulation with TH may initiate rapid melanophore differentiation (McMenamin et al., 2014). Therefore, if the melanophore precursors are already in place and poised to differentiate in A. triostegus, it is possible that they could become melanized within a few hours upon direct stimulation with TH. Our NH3 treatments suggest that this may not be the case (Figure 3—figure supplement 2), but this remains an open question that requires further investigation. Altogether, our findings indicate that the onset and coordination of metamorphosis are two distinct events, both coordinated by TH and under environmental control. They further demonstrate that A. triostegus larval recruitment is a TH-controlled metamorphosis, as in amphibians and flatfishes (Brown and Cai, 2007; Laudet, 2011; McMenamin and Parichy, 2013). Model of Acanthurus triostegus metamorphosis and disruption by chlorpyrifos. (A) Schematic representation of coral reef fish larval recruitment. TH level is plotted on the Y axis and development on the X axis. The onset of metamorphosis is in the open ocean and environmental influence upon development is plotted on the X-axis. 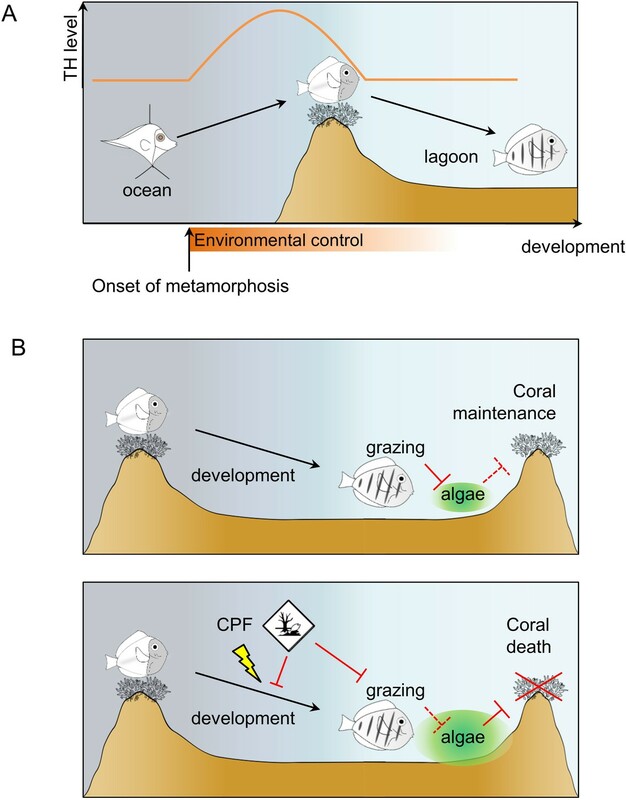 (B) Consequences of undisturbed (upper panel) and CPF disturbed (lower panel) metamorphosis on grazing activity, and subsequent algal spreading and potential coral survival. Solid red bar indicates inhibition; dotted red line indicates lack of inhibition. We demonstrated that the decrease of both T4 and T3 after reef entry can be generalized to phylogenetically distant coral fish species (Figure 4). We propose that this decrease is valid for most if not all coral reef fishes, even if species-specific variations on this general theme can be observed, and that the larval recruitment of coral reef fish corresponds to a TH-controlled metamorphosis (Figure 6A). Interestingly, variations in the magnitude of TH changes among the five coral reef fish species (Figure 4) are reminiscent of the situation in stickleback, where differences in TH signaling between two ecotypes support life history trait variation (Kitano et al., 2010; Kitano and Lema, 2013). We anticipate that this post-embryonic developmental step is shaped by evolution and varies according to species-specific life history traits such as pelagic larval duration, size at reef colonization and pigmentation status (i.e., metamorphic state of advancement) at recruitment. Given the dramatic diversity of life history strategies they propose, coral reef fish could be excellent models to decipher how these changes are elicited by changes in hormonal systems. Among the endocrine disruptors already evidenced and encountered in coral reefs, CPF is known to be a thyroid disruptor with adverse effects on fish behavior (Sandahl et al., 2005; Kavitha and Rao, 2008; Roche et al., 2011; Yang et al., 2011; Botté et al., 2012; Deb and Das, 2013; Juberg et al., 2013; Slotkin et al., 2013). We demonstrated that CPF exposure reduces A. triostegus physiological level of T3 at larval recruitment (Figure 5A). Consistently with our observations on NH3 treated fish, exposure to CPF impairs metamorphosis, as evidenced with the repression of guts’ lengthening (Figure 5B), and the decrease in the juveniles’ grazing activity (Figure 5C). This latter point led to a reduced algal removal efficiency (Figure 5D). As A. triostegus is one of the major herbivorous fish in coral reefs, this can severely impair the ability of coral reefs to recover after an algal invasion (e.g., after a bleaching event) and therefore contributes to the worldwide degradation of reef health (Russ, 1984; Almany et al., 2007; Ledlie et al., 2007; Hughes et al., 2007; Hughes et al., 2014) (Figure 6B). Our results highlight how coral reef fish larval recruitment, the transition between the open ocean and the reef, is a TH-regulated metamorphosis at the crossroads of ecological, developmental, physiological and behavioral transformations (Holzer and Laudet, 2015). These findings also demonstrate how coral reef fish TH signaling and larval recruitment processes can be altered by reef pollution. Since metamorphosis and larval recruitment are essential for the maintenance of fish populations and subsequent coral reef resilience, this study provides a general framework to better understand, at the molecular level, how global changes, water pollution and human activities can threaten reef ecosystems. Acanthurus triostegus, Ostorinchus angustatus, Chaetodon lunula, Chromis viridis and Rhinecanthus aculeatus larvae were captured at Moorea Island, French Polynesia. Larvae were captured during the night while colonizing the reef crest, using a crest net and hand nets (Dufour and Galzin, 1993; Besson et al., 2017). Larvae were then kept in cages located in situ in the lagoon and provided with continuous food from the water column supplemented with coral rubble and algal turf. For the clarity of this study, the age in day of the juvenile corresponds to the number of day spend in the reef in cages since capture, not the absolute age. Near ocean A. triostegus larvae were sampled at 1–2 km away from the reef crest using drifting light trap and hand nets from 0.5 m to 5 m depth. Far ocean A. triostegus larvae were also captured offshore by trawl haul more than 10 km away from the reef between 1 and 60 m deep. Larvae were euthanized in MS222 at 0.4 mg.ml−1 in filtered seawater. For TH dosage, larvae were frozen dry and conserved at −20°C prior to extraction. For RNA extraction, larvae were lacerated and kept in RNAlater (Sigma) 1 hr on ice and stored at −20°C. For histology, larvae were rinsed in PBS 1X, dissected and the intestines were kept in Bouin’s fixative at room temperature. For µCT scan and metagenomics, Larvae were kept in 70% ethanol at room temperature. Acanthurus triostegus captured at the crest were injected with 20 µl of drugs in the ventral cavity. Drugs tested were as follows: (i) solvent control (DMSO diluted 10.000 times in Phosphate Buffer Saline 1X, as all drugs were made soluble in DMSO and diluted 10.000 in PBS 1X); (ii) T3 + iopanoic acid (IOP) both at 10−6 M,; (iii) NH3 at 10−6 M; and (iv) T3 + IOP + NH3 all at 10−6 M. IOP was used as an inhibitor of deiodinase enzymes, as evidenced in mammals and amphibians (Galton and Hiebert, 1987; Galton and Hiebert, 1988; Galton, 1989; Simonides et al., 2008; Medina et al., 2011; Renko et al., 2012), and as routinely used in fish to prevent the immediate degradation of injected T3 (Little et al., 2013; Lorgen et al., 2015). NH3 is a known TR antagonist in vertebrates (Lim et al., 2002), a notion we confirmed in A. triostegus (Figure 2—figure supplement 1D). NH3 prevents the binding of TH on TR and impairs the binding of transcriptional coactivators to TR, which therefore remain in inactive conformation (Figueira et al., 2011; Lim et al., 2002). Fish were then kept in the lagoon in in situ cages and injected daily following the same protocol to maintain pharmacological treatment. Fish were sampled on the second and fifth day after the beginning of this protocol. DMSO non toxicity was tested by comparing the pigmentation, the teeth development, the intestine length and internal structures between solvent-control individuals (treated with DMSO diluted 10.000 times in PBS 1X), and control individuals (simply raised in situ in lagoon cages as mentioned in the previous paragraph) (Figure 3—figure supplement 1, Figure 3—figure supplement 2). After crest capture, A. triostegus larvae were transferred in aquaria (30 L x 20 W x 20 cm H) in groups of n = 10 fish. Each aquarium was filled with 9 liters of UV-sterilized and filtered - 10 µm filter, and was equipped with an air stone. Fish were then immediately exposed to: nothing (control), acetone at a final concentration of 1:1.000.000 (solvent control, as CPF was made soluble in acetone) or CPF at a final concentration of 1, 5, and 30 µg.l−1, as previously done in the literature in another coral reef fish (Botté et al., 2012). All water was replaced every day, ensuring the maintenance of water quality as well as a continuous concentration of the pesticide or solvent. Fish were sampled the 2nd and 5th day after the beginning of this protocol. Acetone non toxicity was tested by comparing the TH levels, the pigmentation, and the intestine length between solvent-control and control individuals (Figure 5A–B, Figure 5—figure supplement 1A–B). Muscle from adult fish and whole larvae were used. Samples were cut using sterile scalpel blades and crushed in a Precelyss with Qiagen extraction buffer. RNA extractions were performed using the Macherey-Nagel RNA extraction kit following the manufacturer’s instructions. Total pooled RNAs were retro-transcripted with the Invitrogen Super Script III enzyme following the manufacturer’s instructions. For TR cloning, actinopterygian universal primers (Figure 2—figure supplement 2) were designed for TRα-A, TRα-B and TRβ to retrieve the full-length sequences of the genes. For polD2 and rpl7, actinopterygian universal primers were designed to retrieve partial sequences including at least one exon-exon junction. PCR amplicon were cloned in the Invitrogen PCR II plasmid following the manufacturer instruction for sequencing. TRα-A, TRα-B and TRβ were subcloned in pSG5 between EcoRI sites for in cellulo expression. Far ocean to day 8 juveniles were assayed. For each larvae 1 µg of RNA were used for retro-transcription using the Invitrogen Super Sript III following the manufacturer’s instructions, including a DNAse I treatment. qPCR primers were designed to anneal on different exons, Rpl7 and Pold2 were used as normalization genes (Figure 2—figure supplement 2). qPCRs were performed in 96 well plate with the BioRad IQ Syber Green Super Mix in 10 µl of final reaction per well following the manufacturer’s ratios. qPCRs were assayed in a BioRad thermocyclers and analysed on BioRad CFX Manager software. Assays were performed on duplicates in at least two independent RNA extractions and retro-transcriptions. Klf9, which is known to respond to TH signaling, was used as a TH signaling reporter gene. The amino acid sequences of A. triostegus cloned TRs as well as available TR sequences (Figure 2—figure supplement 3) were aligned using MUSCLE software. Trees were generated using the Maximum Likelihood method with the Seaview four software under the JTT model with estimated gamma shape and eight rate categories (RRID:SCR_015059) (Gouy et al., 2010). Bootstrap analysis of 1000 replicates was carried out to support the tree. Human embryonic kidney 293 cells (ATCC:CRL_11268, RRID:CVCL_0045) (Iwema et al., 2007; Gutierrez-Mazariegos et al., 2014; Sadier et al., 2015) were grown in Dulbecco’s modified Eagle’s medium supplemented with 10% of coal stripped foetal bovine serum and penicillin/streptomycin at 100 µg.ml−1. Cell were maintained at 37°C, 5% CO2 and tests for mycoplasma contamination were negative. The transient transfection assays were carried out in 96-well plate with 30 000 cells per plate using Exgen500 according to the manufacturer’s instructions. For each well, cells were transfected with 50 ng of total DNA: 12,5 ng of full-length receptor encoding plasmid, 12,5 ng of reporter plasmid with four DR4 repeat in the luciferase promoter, 12,5 ng of β-galactosidase encoding plasmid and 12,5 ng of pSG5 empty plasmid. Drugs were incubated for 48 hr and cells were harvested using a passive lysis buffer and frozen at −20°C. On half of the lysate, luciferase activities were assayed with the luciferase reagent buffer from Promega on a Veritas Turner Biosystem luminometer. On the other half of the lysate, the β-galactosidase activity was measured using ONPG substrate and absorbance at 420 nm for normalization. Each assay was performed at least three times independently on well triplicates. Drugs from Sigma-Aldrich were diluted in DMSO à 10−2 M then in sterile PBS1X prior treatment. TH were extracted from dry-frozen fish following an extraction protocol adapted from previous publications relating TH level variations in teleost fish (Tagawa and Hirano, 1989; Einarsdóttir et al., 2006; Kawakami et al., 2008). Far ocean larvae to day 8 juveniles were assayed. At least three individuals per sampling point were used. Each fish was first crushed with a Precelyss in 500 µl methanol, centrifuged at 4°C and supernatant reserved, three times. Pooled supernatant were dried at 70°C. Hormones were re-extracted with 400 µl methanol, 100 µl chloroform and 100 µl barbital buffer twice from the first dried extract. Pooled supernatant was dried out and extract was reconstituted in 2 ml of PBS1X for quantification. The quantification was performed following the Roche ELICA kit on a Cobas analyser by a medical laboratory according to the manufacturer’s standardized method. The intestines in Bouin’s fixative were embedded in paraffin. Sections of 5 µm were performed in the proximal, medial and distal part using a microtome (Leica). The histological sections were stained with Hematoxylin and Eosin. Photography were taken on a Leica microscope and the mosaic reconstructed using Image J software. For 16S mass sequencing, juveniles of 2, 5, 8 days after reef entry and adult A. triostegus gut were dissected in triplicates for a total of twelve samples. Total DNA was extracted with a Macherey-Nagel DNA extraction kit following the manufacturer’s recommendations. 16S library were constructed for each individual using the Ion 16S Metagenomic kit from Life technologies following the manufacturer’s recommendations. Sequencing of bacterial 16S was performed using a PGM Ion Torrent. Three controls for contaminations were performed. The environment control consisted of an open tube during the dissection. The extraction control monitored the DNA extraction process. The blank control monitored the library construction. The sequencing results were then analyzed using the Life technologies 16S pipeline. 18S mass sequencing was performed on crest larvae, 8 days juveniles and adults in triplicates. Intestine contents were extracted in the same condition as 16S. 18S library were constructed with the pre-amplified V7 region of the eukaryotic 18S (Figure 2—figure supplement 2). A blocking primer was designed to prevent the amplification of host sequences (Figure 2—figure supplement 2). The blocking primer was designed to partially overlap the 18S reverse primer and was modified with a C3 spacer. Sequencing was performed using a PGM Ion Torrent. The sequences were assembled and blasted against the PR2 database, completed with 18S sequenced from multi-cellular organisms for taxonomic affiliation. Fish samples were conserved in 70% ethanol, dehydrated in successive baths of 95% ethanol, twice 100% ethanol and in vacuum arena for at least 4 hr. X-ray microtomographies were performed on a Phoenix Nanotom (General Electric) at 70 kV of tension, 100 mA of intensity with a tungsten filament. 3000 images per sample were taken at 500 ms of exposure per image and at a resolution ranging from 2.5 to 2.8 µm. 3D volumes were reconstructed and analysed with VGI studiomax software. For each condition (e.g. hormonal treatments, pesticide conditionings), 18 fish were placed in a 5 liter tank with coral rubbles covered with turf algae. After an acclimation period of 1 hr, we recorded the total number of bites made on turf algae during 10 min. This experiment was replicated with a new batch of fish 3 to 6 times depending on the condition. For each pesticide exposition conditioning, we weighed (underwater) 3 pieces of coral rubble prior the introduction of a group of 20 crest captured fish (weight A), and after 5 days of grazing by this group of fish (weight B). For each piece of coral rubble, the weight of grazed algae was estimated through the difference weight B minus weight A. All statistical analyses were conducted using the R-Cran project free software (http://www.rproject.org/, R-3.3.1). Mean comparisons were performed using Wilcoxon-Mann-Whitney U-test when comparing two means, and using univariate analysis of variance (ANOVA) followed by Tukey post-hoc test (should a significant difference be detected) for multiple comparisons. Prior ANOVA, normality of values (or residuals) and variance homogeneity were assessed using Shapiro and Bartlett tests. In qPCR analyses, comparisons of gene expression were performed through Student's t cumulative distribution functions, automatically computed by qPCR software CFX Biorad Manager, (CFX Manager SH, 2017). All statistical information and data are available in each Figure source data (see Figure captions). Journal of Clinical Investigation 116:2571–2579. Integrative and Comparative Biology 46:655–661. In: L. E Braverman, R. D Utiger, editors. Werner and Ingbar’s the Thyroid (7th Edn). Philadelphia: Lippincott-Raven. pp. 111–124. General and Comparative Endocrinology 112:10–16. Current World Environment Journal 8:77–84. 327–355, Variable replenishment and the dynamics of reef fish populations, Coral Reef Fishes: Dynamics and Diversity in a Complex Ecosystem. Marine Ecology Progress Series 102:143–152. Molecular Biology and Evolution 27:221–224. Regulatory Toxicology and Pharmacology 66:249–263. Environmental Toxicology and Pharmacology 26:192–198. General and Comparative Endocrinology 155:597–606. General and Comparative Endocrinology 132:321–332. Behavioral Ecology and Sociobiology 58:18–26. Marine Ecology Progress Series 475:303–307. 171–199, The biology, behavior, and ecology of the pelagic, larval stage of coral reef fishes, Coral Reef Fishes: Dynamics and Diversity in a Complex Ecosystem. Journal of Biological Chemistry 277:35664–35670. General and Comparative Endocrinology 135:345–357. Marine Ecology Progress Series 176:25–38. Marine Ecology Progress Series 20:23–34. Environmental Toxicology and Chemistry 24:136–145. Journal of Clinical Investigation 118:975–983. Does thyroid disruption contribute to the developmental neurotoxicity of chlorpyrifos? Environmental Toxicology and Pharmacology 36:284–287. Environmental Biology of Fishes 56:53–65. General and Comparative Endocrinology 76:437–443. Molecular and Cellular Endocrinology 246:10–20. General and Comparative Endocrinology 109:75–85. Thank you for submitting your article "Fish larval recruitment is a metamorphosis sensitive to reef pollutants" for consideration by eLife. Your article has been reviewed by three peer reviewers, and the evaluation has been overseen by Marianne Bronner as the Senior Editor and Reviewing Editor. The following individuals involved in review of your submission have agreed to reveal their identity: Sarah K McMenamin (Reviewer #1); David Hazlerigg (Reviewer #2); Alexander Schreiber (Reviewer #3). This paper considers the role of thyroid hormone in larval development in reef dwelling fish, with an emphasis on endocrine disruption and possible impacts on ecosystem health. Although the implication of TH in metamorphic change in reef dwelling fish is not surprising, the predicted impacts in terms of reef grazing are quite impressive. Thus, this is an important and timely study, one that successfully integrates endocrine, developmental, ecological, and toxicological influences on a key life history transition in a reef fish. Much of the text is cumbersome to read due to English not being the primary language of the authors. Specific required changes are listed below. 1) On the drug / endocrine disruptor treatments, the authors are vague about mode of action. E.g. iopanoic acid (IPA) is described as "an inhibitor of T4 degrading enzymes": actually IPA inhibits TH deiodinases, which act on both T4 and T3, and at least in mammals it is selective for outer ring deiodination by dio2. In fish the picture is probably less clear, due to uncertainties about pharmacological selectivity. Some more effort at clarity in this direction – not only for IPA but also for the other compounds employed – would be welcome. 2) By far the most interesting aspect of the study is the determination that larval recruitment in this species is indeed a TH-mediated process that induces diverse morphological and behavioral changes. The effects of chlorpyrifos on metamorphosis are interesting, but it is certainly a stretch to imply that chlorpyrifos is representative of all pollutants (there are many pollutants that likely don't affect TH, but instead affect other pathways, such as estrogen signaling). Therefore, the title should be revised as follows: "Larval fish recruitment to reefs is a thyroid hormone-mediated metamorphosis sensitive to the pesticide chlorpyrifos". 3) The various morphological and histological analyses performed on natural A. Triostegus metamorphosis are excellent, and the changes in the gut are particularly fascinating! Considering this, it is surprisingly that the authors did not report the effects of T3/NH3 treatment or of CPF on any of these morphological features. Do these compounds have any effect on cross-sectional development of the gut, pigmentation, or dentition? If so, this should be reported and shown in a figure/table. 4) Please add more discussion of the gut 16S sequencing results. What does this imply about the ecology of larval vs. adult fish, and how does it integrate with the changes in craniofacial/tooth morphology and gut structure? 5) Are there any changes in pigment pattern, dentition or gut morphology in goitrogen-treated fish relative to controls? These should be shown, or if there are no changes, the lack of changes should be discussed. 6) Are there ocean samples for the other species examined in Figure 4? It would be valuable to show the increase in TH as fish approach the crest. 7) Are there any phenotypic aspects of metamorphosis that are blocked with CPF treatment? The reviewers correctly pointed out our mistake in presenting the iopanoic acid (that we abbreviate IOP but that is abbreviated IPA by the reviewers) as “an inhibitor of T4 degrading enzyme”. We have corrected this mistake and changed this text into: “IOP being used as an inhibitor of the deiodinase enzymes”. To introduce the deiodinases to the reader we have also added the following sentence and reference in the Introduction: “The transformation of T4 into T3, and the degradation of T4 and T3 are controlled by a family of enzymes called deiodinases (Bianco and Kim 2006).” Concerning the selectivity of IOP (or IPA) for the outer ring deiodination performed by dio2, we are not aware of such a specificity. We have found some research discussing the effective inhibition of dio3 by IOP in mammals (Simonides et al. 2008; Medina et al. 2011). Moreover, in amphibians, both the inner ring and outer ring deiodination are inhibited by IOP, indicating that all the types of deiodinases are inhibited by IOP (Galton and Hiebert 1987; Galton and Hiebert 1988; Galton 1989). Nevertheless, we agree that deiodinases are less known in fish than in mammals and amphibians, because of fewer research. In our study, we used IOP to prevent the rapid degradation of T3 in the injected fish. Such treatments are routinely performed in fish to inhibit deiodinases (Little et al. 2013; Lorgen et al. 2015). Given the existing literature about IOP and its use, we believe that adding IOP to T3 can effectively prevents T3 degradation to ensure that the treatment exert a biological activity. We have added these clarifications in the Results section: “T3 + iopanoic acid (IOP) both at 10-6 M, IOP being used as an inhibitor of the deiodinase enzymes that therefore prevents the degradation of injected T3 (Galton 1989; Little et al. 2013; Lorgen et al. 2015)”, and in the Materials and methods section: “IOP was used as an inhibitor of deiodinase enzymes, as evidenced in mammals and amphibians (Galton and Hiebert 1987; Galton and Hiebert 1988; Galton 1989; Simonides et al. 2008; Medina et al. 2011; Renko et al. 2012), and as routinely used in fish to prevent the immediate degradation of injected T3 (Little et al. 2013; Lorgen et al. 2015)”. The other compound that we used is NH3, a TR antagonist that binds mammalian TR with a nanomolar affinity (Figueira et al. 2011). This compound works by preventing the binding of TH on TR (by occupying the pocket to which T3 normally binds) therefore impairing the recruitment of coactivators on TR, which thus remain in an inactive conformation (Figueira et al. 2011). To confirm the efficiency of NH3 as an antagonist on A. triostegus TRs, we have added, as a new panel D in Figure 2—figure supplement 1, the results of a transactivation assayexperiment. This experiment shows that, in A. triostegus, the TR transcriptional activity induced by T3 is competitively inhibited in presence of NH3, in a dose dependant manner. Consequently, we have also added this clarification about NH3 in the Results section: “NH3 at 10-6 M, NH3 being used as an antagonist of TR that prevents the binding of TH on TR (Lim et al. 2002; Renko et al. 2012) therefore disrupting A. triostegus TH pathway (Figure 2—figure supplement 1D)” and in the Materials and methods section: “NH3 is a known TR antagonist in vertebrates (Lim et al. 2002), a notion we confirmed in A. triostegus (Figure 2—figure supplement 1D). NH3 prevents the binding of TH on TR and impairs the binding of transcriptional coactivators to TR, which therefore remain in inactive conformation (Figueira et al. 2011; Lim et al. 2002).”. We did not use goitrogens in this study, indeed goitrogens are inhibitor of TH synthesis and given that the TH level are already high in the crest captured larvae and decrease in the following days, we believe that goitrogen treatment would not be appropriate. We agree with the reviewers. We have changed the manuscript title accordingly to the reviewers’ recommendations: "Fish larval recruitment to reefs is a thyroid hormone-mediated metamorphosis sensitive to the pesticide chlorpyrifos". Following reviewers’ recommendations we have conducted additional analyses in order to answer these concerns. These analyses have been performed on additional samples that we possessed since our initial sampling campaigns, and on new samples that we captured during a new sampling campaign dedicated to these revisions. As suggested we have looked for effect of these compounds on teeth and guts development, as well as pigmentation. First, we did not observe any difference in teeth development between larvae treated with T3, NH3, or relocated on the external slope (see Figure 3—figure supplement 1, first column). 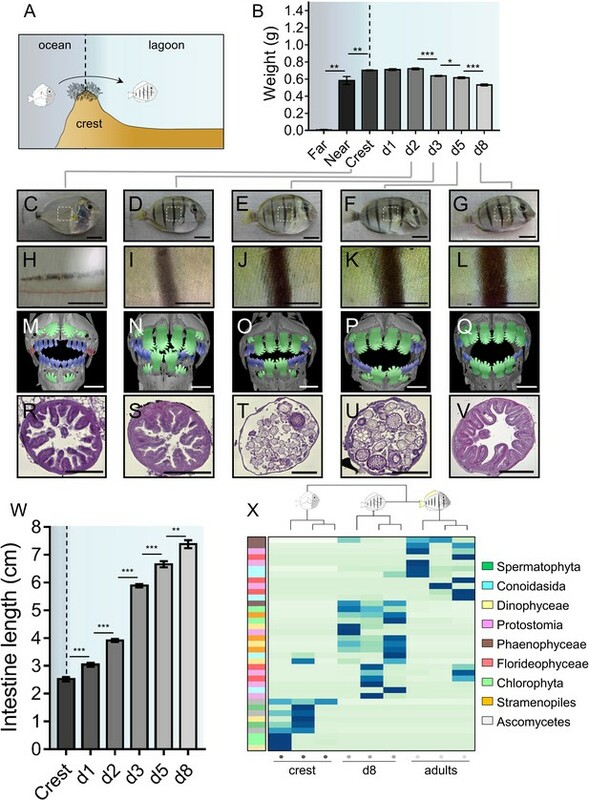 Actually, it is not surprising that neither 2 to 5 days hormonal treatments nor environmental conditioning affect this developmental process, since teeth remodeling starts very early on in oceanic larvae, even before they enter in the reef (see Figure 1M). Furthermore this remodeling is a lengthy process (see Figure 1M-Q). We have discussed this point in our manuscript by adding: “We did not observe any effect on teeth development neither with T3+IOP or NH3 treatment, nor with external slope relocation (Figure 3—figure supplement 1). Given that teeth remodeling is a lengthy process that starts very early on in oceanic larvae and therefore before reef colonization, it is not surprising that the treatments performed on crest captured larvae do not affect (or are too late to affect) teeth development”.Consequently to this observation, we did not proceed teeth morphology analyses in fish exposed to chlorpyrifos (CPF), as it seems unlikely that such exposure could lead to any teeth remodeling difference given that hormonal treatments did not. However, we did not observe any obvious difference in pigmentation between control larvae and larvae treated with T3+IOP, NH3 or exposed to CPF, both at day 2 and day 5. We have provided two additional figures (Figure 3—figure supplement 2 and Figure 5—figure supplement 1B) to present these observations that we have added in the Results section as follows: “Also, contrarily to individuals relocated on the outer slope, we did not observe any effect of T3+IOP nor NH3 treatments on skin pigmentation at day 2 and day 5 (Figure 3—figure supplement 2). This suggests that pigmentation during the larva to juvenile transition is strongly coupled to the environment but is not directly under TH control that may not sustain such rapid pigmentation changes” and: “We did not observe any effect of CPF treatments on fish pigmentation at day 2 and day 5 (Figure 5—figure supplement 1B).” We suspect other hormonal systems to be at play here (cortisol in particular) and we are planning to test this hypothesis in a future study. Finally, concerning the gut histology, we have performed and analyzed cross-sections of guts in fish treated with T3+IOP or NH3, as well as in fish relocated on the external slope. We observed interesting effects of these treatments on the microvilli remodeling during metamorphosis and we have added two additional figures to present these results (see Figure 3F and Figure 3—figure supplement 1). Indeed, we observed an early disappearance of microvilli in T3+IOP treated fish at day 2 post-settlement (in comparison to the control group, Figure 3F, second column, first row) and an advanced development of the second batch of microvilli (accompanied with an advanced thickening of the gut epithelium) in T3+IOP treated fish at day 5 post-settlement (Figure 3F, second column, second row). At the opposite, NH3 treatment and external slope relocation both prevented guts remodeling at both day 2 and day 5, as evidenced in Figure 3F (third and fourth column). These changes are perfectly consistent with the notion that guts remodeling at metamorphosis (both the lengthening and the microvilli renewal) are controlled by TH. Please note that for reading convenience, the former Figure 3F, is now the Figure 3G as the guts cross-sections have been inserted as the new Figure 3F. Also former Figure 3B is now Figure 3E as Figures 3C-E have been relabeled Figures 3B-D to present the experimental setup of Figure 3A earlier in the text (which lead us to also present the results of the external slope relocation earlier in the text, and therefore to relabel all the panels of Figure 3). Concerning CPF exposure, we do not possess biological samples that would permit us to analyze guts histology. Indeed, despite our substantial efforts and the additional sampling campaign, we did not succeed to capture/handle/transfer (from French Polynesia to France) these specific fish. However, we performed gut length analyses on extra frozen samples that we had conserved, and we observed, as expected, that the guts’ lengthening usually occurring at metamorphosis is delayed when fish are exposed to 5 and 30 µg.l-1 CPF (Figure 5B). This lengthening delay is similar to the one observed with NH3 treated fish (Figure 3B) and is consistent with the notion that gut lengthening is controlled by TH (as evidenced in Figure 3B) as CPF exposure decreases T3 levels (see Figure 5A). These results on guts length and CPF exposure are now presented in Figure 5B and are discussed as follows: “However, CPF exposure at 30 µg.l-1 prevents guts’ lengthening at day 2 (p-value = 0.024, Figure 5B left panel), and both exposure at 5 and 30 µg.l-1 prevent intestines’ lengthening at day 5 (p-values = 0.047 and 0.029 respectively, Figure 5B right panel).” and: “Consistently with our observations on NH3 treated fish, exposure to CPF impairs metamorphosis, as evidenced with the repression of guts’ lengthening (Figure 5B)”. We agree that the discussion following our 16S sequencing experiment results (in the Results section) was too short. We have complemented this discussion and moved it in the Discussion section: “These results highlight profound anatomical and physiological transformations of the skin and the whole digestive tract (Figure 1B-W). […] All these changes from teeth to microbiota are consistent with A. triostegus change of diet after entering the reefs, conforming to previous observations (Randall 1961; McCormick 1999; Frédérich et al. 2012).” As explained above, we believe that changes in the gut bacterial community in A. triostegus are the consequence of the concomitant diet and environmental shifts occurring at larval recruitment. There is apparently some sort of misunderstanding here as we did not treat the fish with goitrogens. We preferred to use NH3, a TR antagonist, to block the TH pathway instead of goitrogens (like methimazole and KClO3) that block the assimilation of iodine in the thyroid follicles or the TH synthesis in those same follicles (Schmidt et al. 2012). As evidenced in Figure 2A, 2B and 2C, levels of TH and expressions of TR are peaking at and before ref entry, so the use of goitrogens on crest captured larvae would not have been appropriate (i.e., too late). In contrast the use of NH3, a TR antagonist, was, to our knowledge, the best solution to disrupt the TH pathway in crest captured larvae. As discussed in full in our response to comment 3), we have effectively scrutinized the effect of NH3 on the pigmentation pattern, the dentition and the gut morphology. As mentioned above, we do observe a consistent effect of NH3 on gut histology and we invite the reviewers to see our reply to comment 3 for more details. We would like to thank the reviewers for this excellent suggestion that strengthens the generalization of our TH-mediated metamorphosis and larval recruitment model to other coral reef fishes and opens new insights for future research in this domain. As suggested by the reviewers in their comment 3, we have analyzed the impact of CPF exposure on guts lengthening (which occurs at metamorphosis). We demonstrated that CPF diminished this lengthening, in very similar way as NH3 treatment (see Figure 3E and Figure 5B). We have performed these requested analyses using supplementary frozen biological samples from our previous sampling campaign. Unfortunately, these frozen samples were not appropriate for gut histology analyzes. Also, we did not analyze the effect of CPF exposure on teeth remodeling since we did not observe any effect of T3 and NH3 treatments, as well as external slope relocation, on this teeth remodeling (as discussed in our reply to reviewers’ concern 3). Considering the lengthy process of teeth remodeling (see Figure 1M-Q) and the fact that this process is already well advanced in crest individuals, it is not surprising that hormonal treatments and external slope relocation did not alter this remodeling, and it would be very unlikely that CPF exposure acts differently. Lastly, there was no effect of CPF exposure on pigmentation (see Figure 5—figure supplement 1B). We invite the editor and the reviewers to see our reply to comment 3 for more details. larval coral reef fish, Scientific Reports, In Press). This study demonstrates that CPF can impair and even reverse visual lateralization in A. triostegus during this critical recruitment step. We thank M Bronner, S McMenamin, D Hazlerigg and A Schreiber for their comments that greatly improved this manuscript. We would also like to thank H Jacob, C Gache, A Gilson, I Moniz, C Berthe, A Savura, D Van Osten and P Schep for their help to catch fish larvae. We thank S Planes, J Burden, T Lorin, M Manceau, P Salis and N Roux for critical reviewing and for their constructive discussion concerning coral fish ecology and development. We are grateful to V Domien for her fruitful advice on the design of the figures. We thank the association Te mana o te moana for the accommodation of our cages. © 2017, Holzer et al.